The air fed into the diaphragm chamber is the control signal from the pneumatic controller. The most widely used signal air pressure is 0.2 bar to 1 bar. Consider a reverse acting actuator (spring-to-extend) with standard 0.2 to 1.0 bar spring(s), fitted to a direct acting valve. When the valve and actuator assembly is calibrated (or ‘bench set’), it is adjusted so that an air pressure of 0.2 bar will just begin to overcome the resistance of the springs and move the valve plug away from its seat. 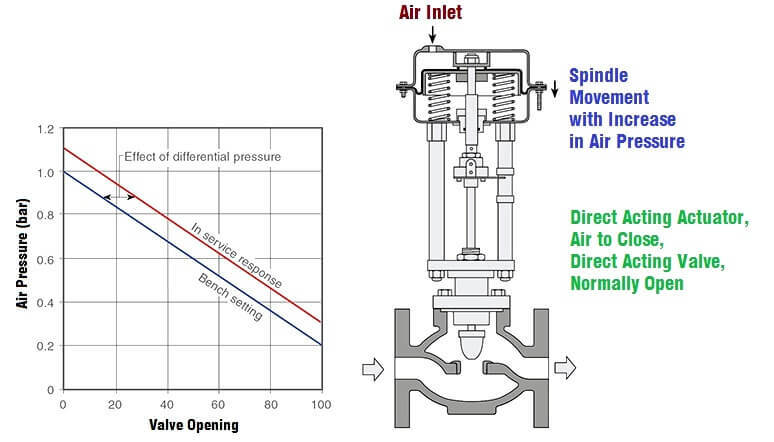 As the air pressure is increased, the valve plug moves progressively further away from its seat, until finally at 1 bar air pressure, the valve is 100% open. This is shown graphically in Above Figure. Now consider this assembly installed in a pipeline in a pressure reducing application, with 10 bar g on the upstream side and controlling the downstream pressure to 4 bar g.
The differential pressure across the valve is 10 – 4 = 6 bar. This pressure is acting on the underside of the valve plug, providing a force tending to open the valve. This force is in addition to the force provided by the air pressure in the actuator. Therefore, if the actuator is supplied with air at 0.6 bar (halfway between 0.2 and 1 bar), for example, instead of the valve taking up the expected 50% open position, the actual opening will be greater, because of the extra force provided by the differential pressure. Also, this additional force means that the valve is not closed at 0.2 bar. In order to close the valve in this example, the control signal must be reduced to approximately 0.1 bar. A minimum, when the process is calling for maximum heat, and the control valve is 100% open. A maximum, when the process is up to temperature and the control valve is closed. If the pressure upstream of the control valve remains constant, then, as the steam pressure rises in the heat exchanger, the differential pressure across the valve must decrease. The Below Figure shows the situation with the air applied to a direct acting actuator. In this case, the force on the valve plug created by the differential pressure works against the air pressure. The effect is that if the actuator is supplied with air at 0.6 bar, for example, instead of the valve taking up the expected 50% open position, the percentage opening will be greater because of the extra force provided by the differential pressure. In this case, the control signal has to be increased to approximately 1.1. bar to fully close the valve. It may be possible to re-calibrate the valve and actuator to take the forces created by differential pressure into account, or perhaps using different springs, air pressure and actuator combinations. This approach can provide an economic solution on small valves, with low differential pressures and where precise control is not required. Larger valves have greater areas for the differential pressure to act over, thus increasing the forces generated, and having an increasing effect on valve position. Higher differential pressures mean that higher forces are generated. Valves and actuators create friction, causing hysteresis. Smaller valves are likely to have greater friction relative to the total forces involved. The solution is to fit a positioner to the valve/actuator assembly. Note: For simplicity, the above examples assume a positioner is not used, and hysteresis is zero. The formulae used to determine the thrust available to hold a valve on its seat for various valve and actuator combinations are shown in Below Figure. To overcome the fluid differential pressure at the closed position. To overcome friction in the valve and actuator, primarily at the valve and actuator stem seals. To provide a sealing load between the valve plug and valve seat to ensure the required degree of tightness. 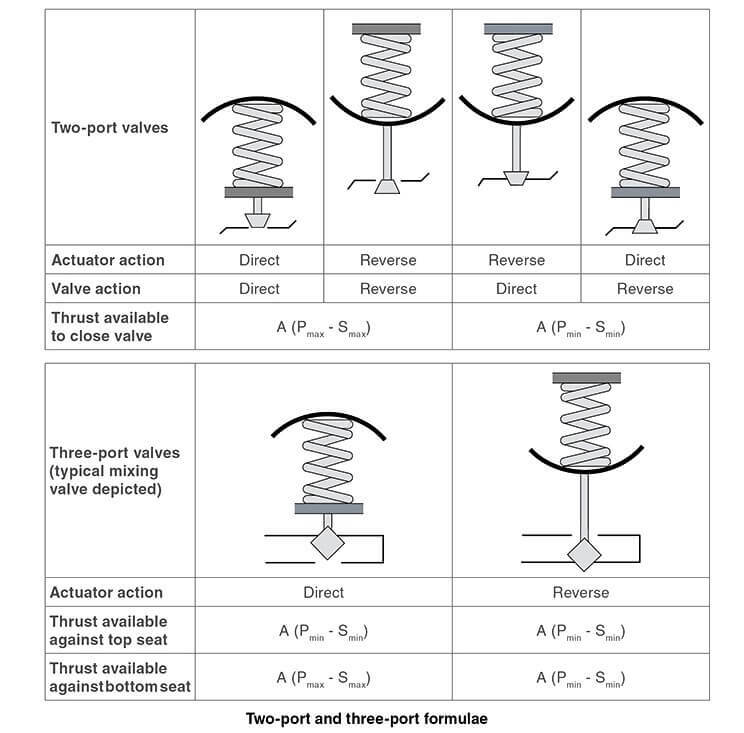 Control valve manufacturers will normally provide full details of the maximum differential pressures against which their various valve and actuator/spring combinations will operate; the Table in Figure is an example of this data. Note: When using a positioner, it is necessary to refer to the manufacturer’s literature for the minimum and maximum air pressures. What is Reducing Valve ? What is a Flange Gasket ? How Globe Valves Work ?